Miss World Canada Competition is in the news! Heads up Toronto, the 2018 Search for Miss World Canada is coming to town. The week-long pageant experience begins Sunday 22nd July. Read our blog to see the highlights. 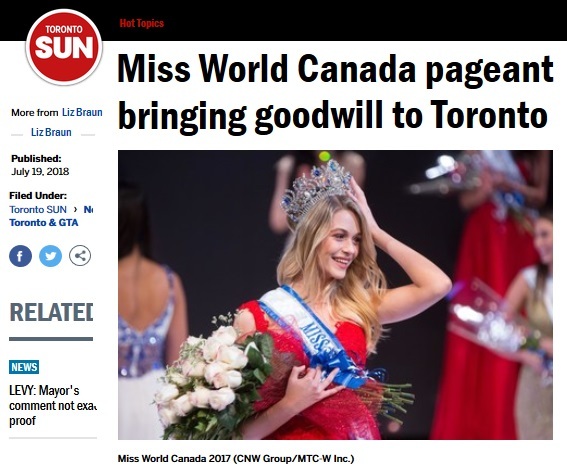 Read our story in Toronto Sun: Miss World Canada Pageant Bringing Goodwill to Toronto. The 2018 competition has fifty-six delegates, one from every province, city and region across Canada, winging their way here from all over the country for the pageant, titled Beauty With A Purpose. What purpose, you ask? Among other things, each young woman will be responsible for a goodwill project because the contestants work to raise money for The Children’s Wish Foundation of Canada. Pageants are no longer just about high heels and the runway, according to event producer Michelle Weswaldi, herself a former Miss World Canada. Weswaldi is the President of MTC-W, Inc. Productions, which produces Miss Teenage Canada, Miss World Canada, and Top Model Search Canada. This past beauty queen and modern mother-of-three took over the Miss World Canada competition last year. Things change, beauty pageants included. While Miss World Canada still has swimsuits, it also has a fitness and strength component — rock climbing this year — and the young women need excellent communication skills to compete. Read their blogs (check the top right corner of this page to see all Province blogs). The Grand Finale competition is on July 28th and takes place at the Lyric Theatre, Toronto Centre for the Arts. The winner — yes, she gets a crown — will go on to compete in the Miss World 2018 competition in Sanya, China. Among the 2018 Judges at Miss World Canada are Caroline Frolic, radio personality and former anchor at The Score; Canadian designer Rachel Sin; Entertainment Tonight Canada Producer Nicole Servinis; Life Coach, author, fitness and bodybuilding expert Reza Zarmehr; and Christina Paruag the editor of FemEvolve magazine, and international model turned chemist (and creator of MC2 beauty line) Melani Chong. Starting this Sunday, the contestants will be in Toronto, touring, shopping and getting ready for the big day. The Penultimate event (the big event before the big event) is almost certainly the Fashion Show at Addison’s Residence. On Friday the 27th of July, starting somewhere between 2pm and 3pm, each delegate will walk the runway in a thrilling high-energy fashion show. 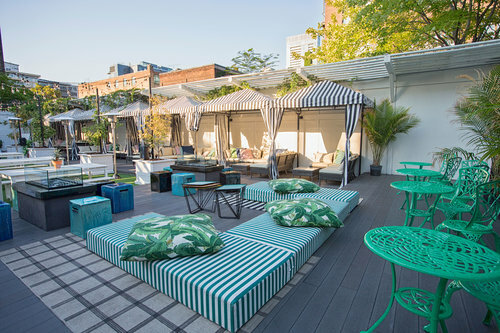 The Addison’s Residence, an up-scale night club patio on Wellington Ave West in the heart of downtown Toronto is sure to be packed that friday afternoon, and the work of Rachel Sin will proudly be displayed. Everyone is invited to attend.